This is the third post in my "Why I love CrossFit" series. In the first post, I talked about my favorite part of crossfit: the camaraderie. In my second post, I focused on how it is always changing, and today it is all about seeing results! I have always minus that 4 year time period called college been very into sports and fitness. All through middle and high school, I ran track and cross country, was on the cheerleading squad and played basketball. That love of getting a good sweat on has continued into adulthood. About 4 years ago I got even more serious about fitness. I went to the gym regularly. I did about an hour of cardio 5 times a week and lifted weights at least 3 times a week. Despite spending hours at the gym each week, I was not getting the results I wanted which were well defined arms and overall strong looking body. I like muscles. I wanted muscles, and although I was putting in a lot of effort, I was not getting the definition I wanted. All of that changed once I started CrossFit. After a few months of CF, I was lifting weights over 65 pounds. In my globo gym, I never lifted more than 10. I thought lifting heavy weights would make me bulky, and not give me the physique I strived for. I was wrong. Lifting heavier did give me more definition, but it didn't make me look like the Incredible Hulk like I feared. Working out was not about weight loss for me. It was about getting stronger and getting defined. I am the same weight (if not more) I was when I started CF, but I can now lift much heavier weight. I front squat more than my own body weight and on any given day I can be found lifting 75lbs, 85lbs, 95lbs, or even more. The sense of accomplishment you get by seeing how much/what your body can do is indescribable. Talk about a rush! Before CF, I would do hundreds of crunches and never see any changes in my abs. In CF, we never do a single crunch. We do things that focus on core strength: knees to elbows, toes to bar, overhead squat. By moving in ways that focus on strengthening my muscles, I was able to get the definition I wanted. 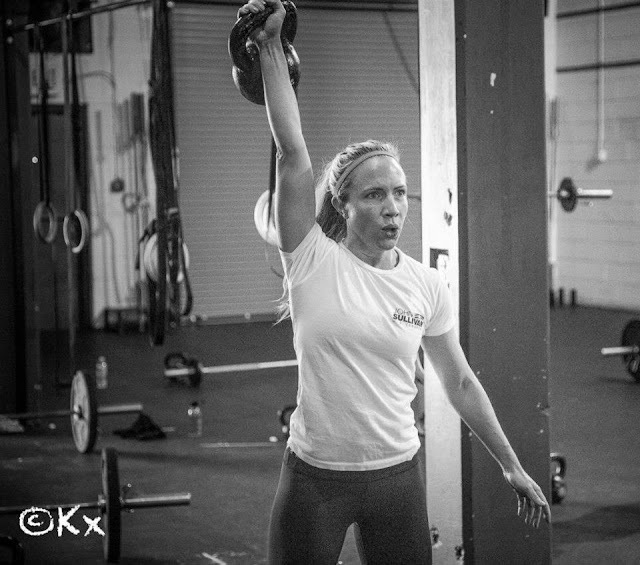 CF is all about high intensity movements. Your WOD might only be about 5 minutes long, but during that time you are going all out, as fast you can, and revving up your heart rate. High intensity interval training leads to burning more overall fat, and thus helping you achieve your overall fitness and personal goals. If you are wanting to change your body for the better whether that is to get stronger, lose weight, or just plain get healthier, crossfit is a great resource. Not only do you get fitter and stronger, but you will see the results you are wanting. CrossFit has given me better self confidence. I love the strong person I have become. Strong is beautiful, and CF will help you get stronger all around in both mind and body. Get it girl! And congrats on the engagement! So happy for you! Thanks Audrey!!! Glad you are loving CF!! !